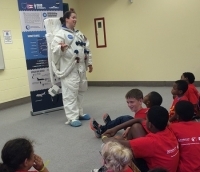 The Lakewood Public Library has partnered with The Armstrong Air & Space Museum to put on two exciting, informative, and hands-on programs this summer. These programs are the perfect combination of STEM – Science, Technology, Engineering, and Math – and our summer reading club theme, “Libraries Rock!” And as always, they’re free! To register, stop by the Children’s and Youth Services desk or call us at (216) 226-8275, ext. 140. Do you play an instrument? Did you know that astronauts like Chris Hadfield play instruments while in space? It’s a match made in the celestial heavens, and now you can join in the fun! Participants in this program will learn about the instruments played on the Gemini VI mission and built a harmonica out of household items. Kids will then be challenged to create their very own song with it! Participants in this program will gain an understanding of the makeup of sounds on Earth and in space. Kids will have the opportunity to explore music through the use of boomwhackers, an instrument that uses different lengths of tubes play different notes. Kids will get to explore, tinker, and create their own music to share with everyone.